I wore this to a wine and chocolate event a local boutique. I brought chocolate and wore my ice cream stuff. I paired the dress with a little sweater to make it a little more dressed up. 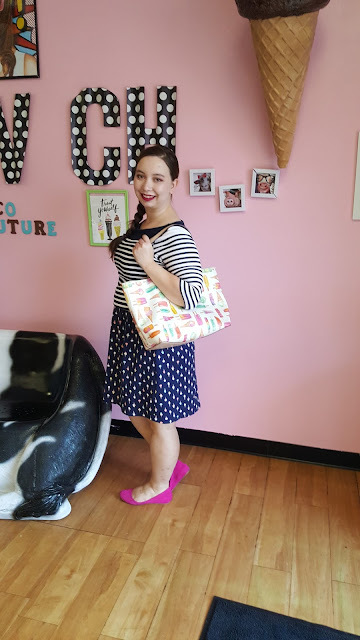 Dress- Macy's (exact), Sweater- Thrift (similar), Bag- Kate Spade (similar, steal), Shoes- JCPenney (similar)I get commission for purchases or clicks made through links in this post. This combo is super cute, lady! 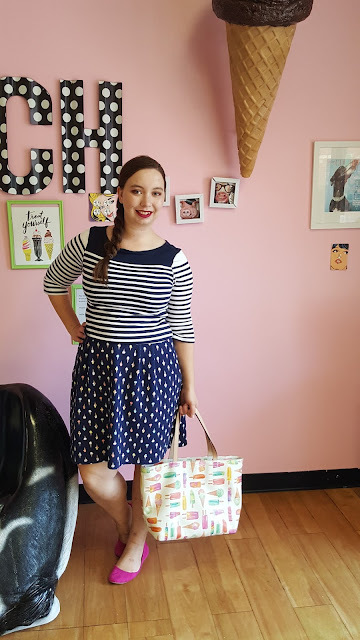 Your navy blue ice cream cone print fit and flare dress from Macy's is beautiful. I also like the looks of your striped sweater with dark yoke and white at the shoulders The ice cream cone bag. I love these outfit photos taken in front of the complementary contrasting pink wall. Great OOTD and great outfit photos! You know I love this look--the ice cream dress is so much fun, and I love it with the sweater over it! 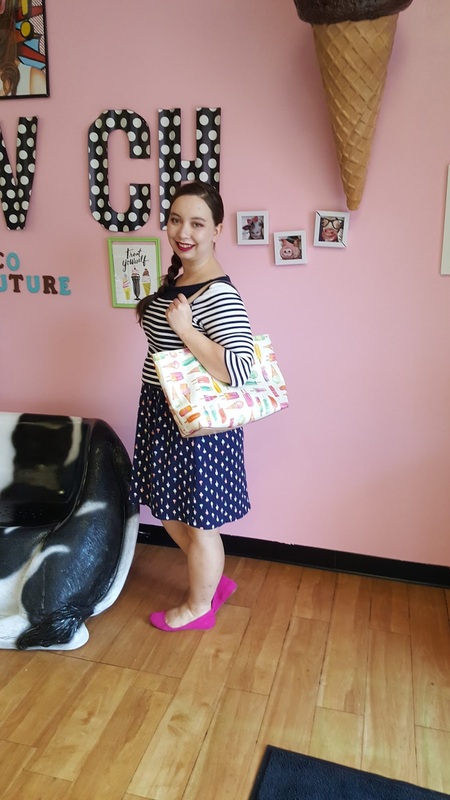 The ice cream print is adorable! What a fun dress and I love it with the striped sweater! Love these patterns together and the bag is so cute! Perfect weekend look! Loving this look, it's so fun! Wine and chocolate sounds like my kinda event! The print is super adorable! I love your confidence and your style! Great blog! Your ice cream bag is so cute, I love that giant one on the wall too! Fun bag! i also like the mix of stripes and polka dots on you. What a cute look! I love the pattern mixing of your top and skirt. 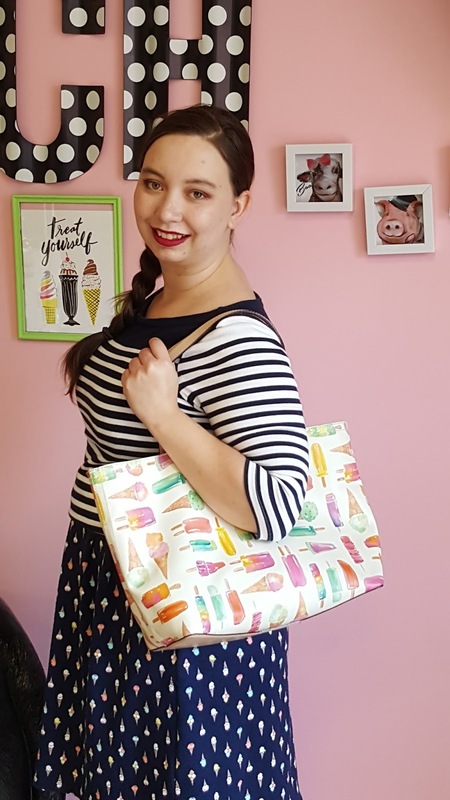 The ice cream tote is adorable and perfect for the event.